This week Deputy Under Secretary Michelle O’Neill is leading a delegation of 12 auto parts and services companies to explore opportunities for sales to the burgeoning Russian auto industry. I am fortunate to be accompanying her and the 12 U.S. companies who are on the mission. We have completed two of our three stops in the mission, having left Samara today. In 2011, vehicles sales in Russia grew 39 percent to 2.6 million units. U.S. auto components and parts manufacturers are well-positioned to help supply the growing Russian auto industry, which grew 98 percent from 2010 to 2011, reaching $125 million. In 2011, Russia imported almost $1.5 billion in U.S.-made components, parts, and finished motor vehicles, an increase of 75 percent from 2010. 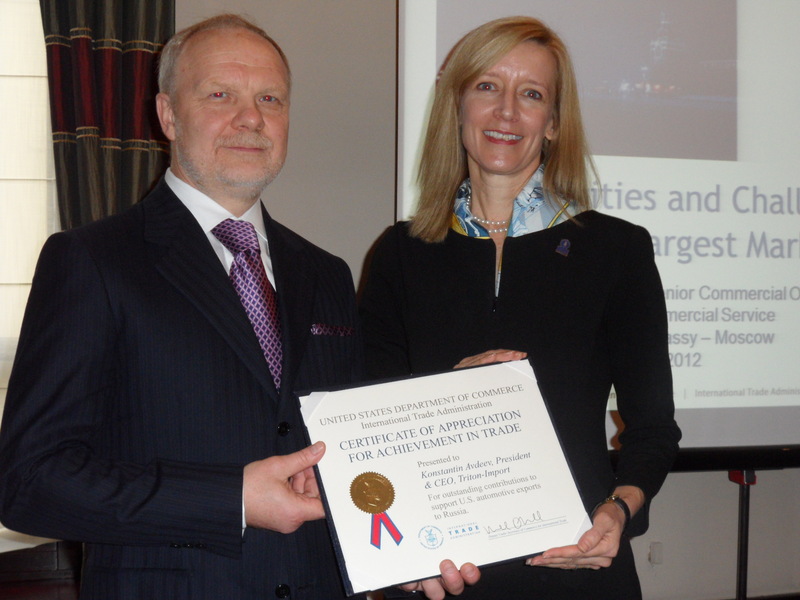 Deputy Under Secretary Michelle O’Neill presents a certificate of recognition to Konstantin Avdeev, President and CEO of Triton-Import for their support of U.S. exporters of automotive spare parts. The trade mission delegation participated in one-on-one meetings with potential business partners in Samara, have met with key Russian Government officials, and visited automotive assembly plants and component manufacturers in Russia’s automotive industry centers. Deputy Under Secretary O’Neill launched the mission in Moscow by presenting Triton-Import, a Moscow-based automotive parts distributor, with the Commerce Department’s Certificate of Appreciation for Achievement in Trade. Triton-Import has helped U.S. companies export more than $50 million in automotive spare parts to the Russian market. “Triton-Import has been an important partner and friend to many U.S. small and medium-sized firms,” O’Neill said. The trade mission advances President Obama’s National Export Initiative which aims to double U.S. exports by the end of 2014, supporting economic and job growth. With more than 140 million consumers and a growing middle class, Russia remains one of the most promising markets for U.S. exporters. Sales of cars and trucks in Russia are currently growing at an annual rate of 30 percent. In 2010, Russian customers purchased 1.9 million cars. This figure includes 646,000 new Russian cars and 1.25 million foreign cars, both imported and produced in Russia. Importers forecast continued rapid growth of approximately 20 percent in 2011. If these trends continue, most experts project Russia will be the largest automotive market in Europe within the next few years. Foreign automakers have taken notice of the Russian automotive market’s potential for growth and are building assembly plants to meet the increasing demand for high-quality automobiles. General Motors, for example, has a $335 million plant in Togliatti, a joint venture with Russian auto giant AvtoVaz. The mission participants will be touring this facility at the end of the week to round out their trip. Other major international producers, including Nissan, Toyota and Hyundai, have made significant investments in St. Petersburg and the surrounding Leningrad oblast, turning it into a new automotive assembly cluster. U.S. mission participants are further encouraged by Russia’s recent invitation to join the World Trade Organization. Russia is expected to accept this invitation and formally join the WTO this summer. As a result, Russia has committed to reducing many of its tariffs on motor vehicles and parts — some of which run as high as 35 percent. It’s an exciting time in the auto industry and Russia is a great market for U.S. auto parts and suppliers to find sales and partners. Samara, formerly known as Kuybyshev, is one of the largest and most prominent regions in Russia. It is also referred as Region 63 and is situated in the south-eastern region of European Russia. Samara region is the administrative hub of the Samara oblast and is one of the most stable leaders of the national economy. Similar to Detroit, Samara is situated close to reliable transportation, has well developed infrastructure for manufacturing and access to parts and supplies. Samara region is renowned across the world for its planes, cars, bearings, aluminum and cables. It is also the hub of the Russian space industry. Satellite launchers, unique aircraft engines and manual space crafts are produced in this region. The Samara region is a hub of innovation and industrial development. It provides the essential environment required for innovative development. This includes, a significant industrial and scientific potential, availability of well-trained personnel and a well-established infrastructure of innovative activities. The obvious advantages of Samara region are the favorable business climate and the multidisciplinary structure of the industrial system. Development of Samara Region’s automobile cluster is a priority in the development of the regional economy. Share of automotive industry in the regional industrial output amounts to more than 35%, in machine building – over 70%. The automobile cluster includes a large number of firms producing cars and car components, as well as providing transport services. Samara Region is one of Russia’s the most significant transport hubs. The share of automobile transportation in the total volume of transported freight is 43%. The extensive network of public paved roads covers 12,700 km (7,891.4 miles). The Moscow – Chelyabinsk federal highway crosses the crosses the region, with links to Kazakhstan, Central Asia and northern parts of Russia. 55 transport companies serve the region′s passenger and freight transport by region and Russia. Railway transportation accounts for 22.8% of freight traffic. Samara Kuibyshevskaya Railway has the total length of 1,389 km (863 miles).